Happy first day of autumn to all my readers in the northern hemisphere! We took a lengthy car drive on Sunday to a pair of waterfalls that I had not ever visited before. This is Upper Beaver Falls outside of Clatskanie, Oregon. This little waterfall is much smaller than its big brother downstream, but lovely just the same. 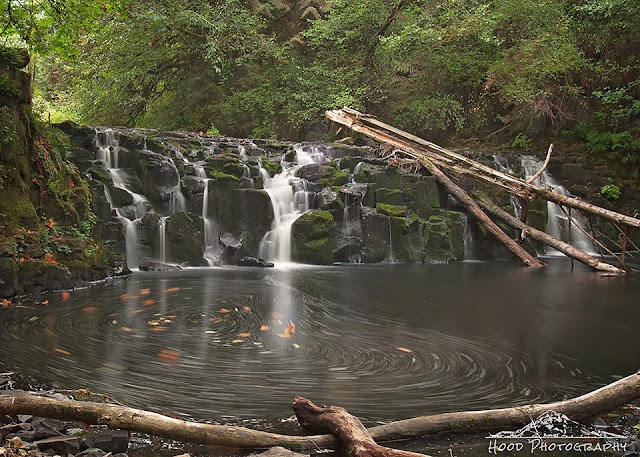 I loved the whirlpool effect that the slow shutter created with the bubbles and leaves in the water! Stunning falls and love the swirl of water at the bottom.